… But that enables someone else to discover their own serenity in a magical and coveted part of Sydney on the ‘Balmoral Slopes’. Built in the 1920s, this elegant two-storey, double brick home has been carefully and lovingly renovated throughout in a contemporary, timeless, international style. From the moment you enter, the quality, ambience and sense of space are immediately evident. The cloak area, striking staircase and large, free flowing rooms just hint at the enchantment within. The lower level lends itself to living and entertaining – either on a relaxed or grand style. The formal sitting room is large and charming, with a magnificent bay window overlooking the front, very private ‘secret’ garden retreat. And for those wanting or needing to work from home, the fully fitted out study/home office leading from the sitting room provides the perfect environment. Space and light are combined with cutting edge technology including four phone and fax lines, ADSL and cable. Other features include slim line built-in shelving, storage and filing cabinets and a second, matching bay window. 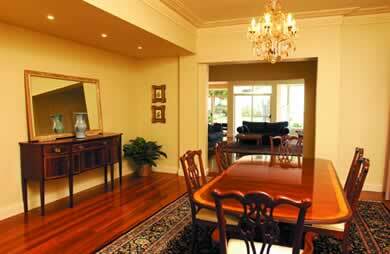 The large dining room completes the ‘formal’ part of the home. Featuring a classic French chandelier, it is ideal for large dinner parties, with enough space to seat 14 or more people comfortably. Beyond the dining room, you will discover the ‘heart’ of the home; the more relaxed living areas. Open plan is an understatement: The vast family room, casual meals area and island-style kitchen are beautifully free flowing with an emphasis on space and light. The kitchen is a gourmand’s delight, with high quality stainless steel appliances, granite benches and masses of cupboard space. And expansive windows and doors provide a perfect vantage point over the terrace and swimming pool – great when you have young children or are entertaining. The paved rear terrace / barbecue area (with in-built gas barbecue) has a distinct resort-like feel. It’s very private, sun-bathed and features an array of tropical and formal plantings, from palm trees, hedges to Augusta Florida gardenias with masses of colour and perfume. The home’s upper level provides a different zone altogether. Four large bedrooms and a bathroom are located around a large family/lounge area. The massive master suite is its own retreat, with ensuite, ‘his & hers’ built-ins and a dressing area. Large windows maximise light, cross ventilation and tranquil district and garden views. The second double size bedroom also has access to a huge attic – excellent for storage. And the other two bedrooms and full bathroom are ideal for children, or are versatile enough to make the perfect, private guest suite for family, friends or a Nanny. Every detail has been carefully considered in this home – from the well-positioned windows and doors designed to maximise the outlook, natural light and cross ventilation; the halogen lighting to highlight artworks; masterfully created shadow lines and cornices; the rich-coloured Jarrah timber flooring on the lower level; wool carpeting on the upper level; UV protected windows; Italian tiles in the bathrooms; and neutral/classic colour schemes. Add to that the air conditioning, hard-wired smoke detectors, phone/fax lines and cabling throughout, and you have everything covered. This is a delightful, free flowing home located on a long, wide block, with two street entrances and very rare traffic. Friendly neighbours abound, with many living here for decades. So imagine if you lived here: a lush, ‘historical’ five minute walk to stunning Balmoral Beach and its plethora of cosmopolitan restaurants and cafes; just two blocks to Mosman Village; minutes to some of Sydney’s best private and public schools; buses around the corner; a short drive to Taronga Zoo; only six kilometres from Sydney’s CBD. Drive into your double, remote controlled garage, close the doors and discover the epitome of serenity.